I think it’s safe to say that practically every equine photographer dreams of capturing the iconic Camargue horses in their natural habitat. 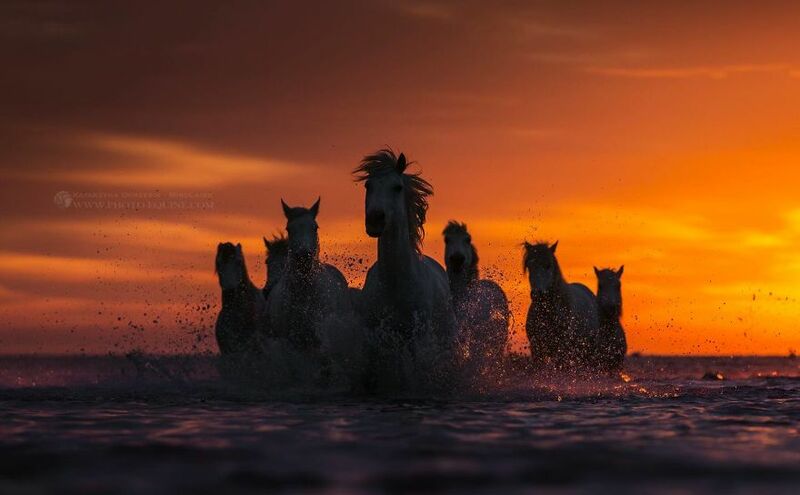 The image of herds of these wild, white horses galloping through the water has become a well-known and romantic association with the Camargue region of the south of France. This dream came true for me last year. 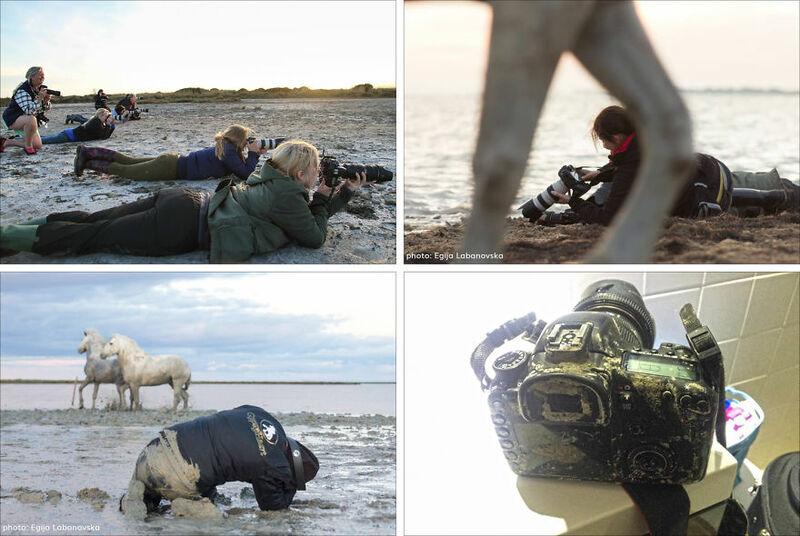 I was continuing my journey through the south-western part of Europe, along with a group of photographer friends, when we visited the Camargue National Park. It was a fantastic spring weekend and we photographed a group of mares and geldings during both the sunset and sunrise. We carefully selected our vantage-points and positions for the shots, which, along with a great sense of timing, allowed for our resulting photos to be similar, yet different enough that they didn’t all look the same. The weather conditions during our visit were downcast and gloomy, which actually ended up working in our favor. The unforgiving wind – well known in this region – constantly blew the clouds towards and then away from us. As a result, during one session we were able to take photographs in different lights, with ever-changing colours of the sky providing diverse and much appreciated backdrops for our photos. The most memorable session of our visit, however, involved the clash of two robust stallions. These two horses were well-known to one another, and this was not the first time (nor the last, I suspect) they’d found themselves performing in front of a photographer’s lense. Neither horse displayed any serious signs of aggression, but rather, a common desire to dominate, play and show off. 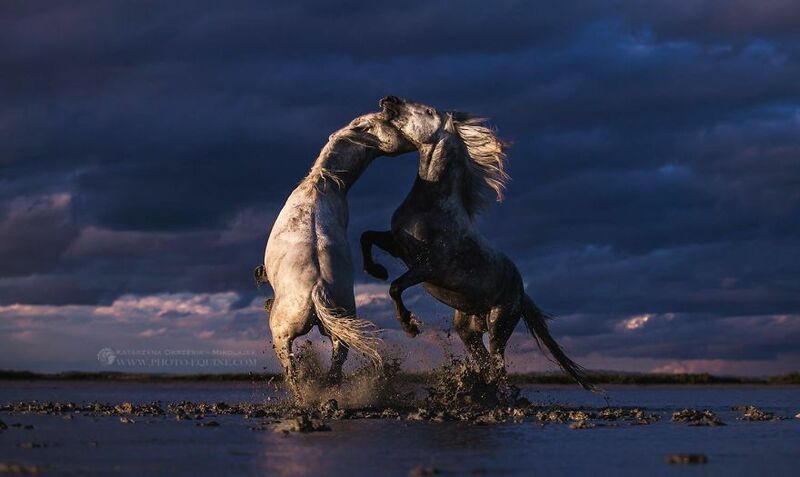 The pair of expressive stallions took turns showing off their strength through their showy “dance”. 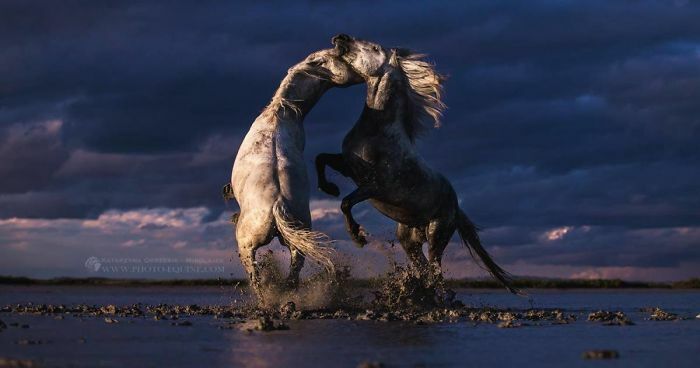 As they flexed their necks and flung their front legs high into the air as they reared – even hooking each other with a leg or a well-placed bite, they appeared as a single white mass of horses, contrasting heavily against the stormy sky. 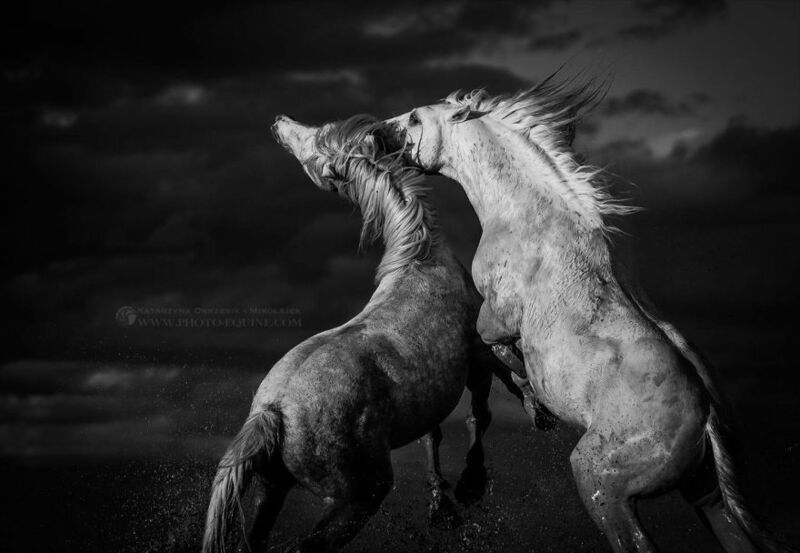 The softness of their long, wavy manes and the subtleness of the pale, grey mud splattered up their legs and bellies added a detailed dynamic to the images. The sun completed the work for us, starting just above the horizon, and wrapping the silhouettes with strong side light mimicking the dramatic colors of the sky. All of this – ethereally beautiful models, ideal lighting, and a location beyond our wildest dreams – made for the most incredible days of photographing horses one could ever imagine. This was our chance to capture the most epic shots of our lives, a chance that may never again be repeated, which is why it is now one of my favorite sessions so far! A herd of white clone-like horses being driven time and again by invisible shepherds, guided to run and play almost exactly where we would have planned it (if we could have). An ever-changing sky, once soft and shimmering pastel, alternated with fiery, dramatic colours. The water’s surface torn by the hooves of animals galloping through in a frenzy. And finally, a poetic clash of the titans. These are the memorable images and captured moments of a lifetime. My love for those Camargue horses was ignited in this trip, and I cannot wait to return to this, the most unique place on earth during my annual travels across the Europe!